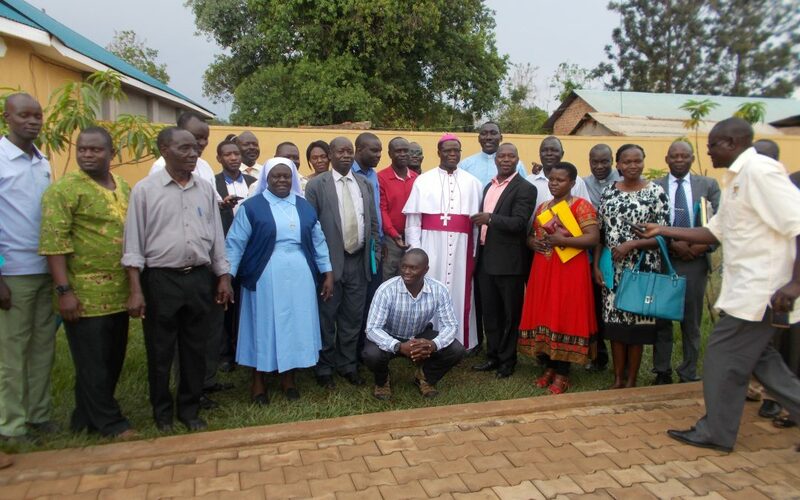 The National Coordinator of Catholic Institutions in Uganda Mr. Mukasa Gerald has called for the revival of the National Catholic Teachers’ Guild which went defunct in 1964 during the Obote 1 regime. By then, the regime did not trust the guild which was also seen as a political threat to then UPC government. Speaking to Radio Wa in an exclusive interview on the sideline of a workshop for Education Secretaries from Gulu Ecclesiastical Province at Tasha Hotel in Lira town, Mr Mukasa (pictured 3rd left in group with Bishop Sanctus Lino Wanok) revealed that the revival of the guild will help boost the education standards of the Catholic founded schools. He clarified that the guild is specifically to seek solutions to the problems and challenges affecting education and find solutions to them and does not in any way connect to any political affiliations. He suggested that members be selected from deanery levels in every Diocese up to the national level.